At EBM Izmir, remember The AEGEEan interviewing locals at the AEGEE Fair? First up were AEGEE-Beograd and AEGEE-Istanbul and for the second round Stephanie Müller, our editor-in-chief, interviewed AEGEE-León and AEGEE-Peiraias, as these antennae are twin antennae, they have been for quite a while, and are setting a good example of why the twin antenna program works. This month, one of the four mentioned antennae is the local of the month because they organised two Summer Universities (SU) this summer, whereas one of them stood out from the crowd with its IT theme. Last time The AEGEEan wrote about AEGEE-Peiraias was when we were preparing for The AEGEEans Choice Awards, trying to find the best flag/mascot stealers. AEGEE-Peiraias had managed to steal the AEGEE-Enschede flag and, in reward, the Spring Agora organisers of 2012 provided the delegates and visitors of AEGEE-Peiraias with 12 comfortable beds. 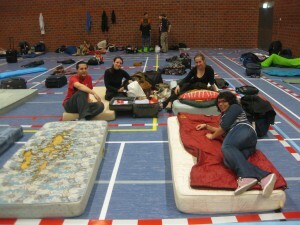 The lucky sleeping beauties described it as “the most comfortable sleep in a gym they ever had”. Founded in 1995, this Greek seaside antenna has grown to be a large one, with 100-120 members, of which most are active. This probably indicates why AEGEE-Peiraias took up the challenge that their twin antenna, AEGEE-León, took last year: to organise two Summer Universities within a short period of time. So The AEGEEan asked the local a few questions about this. How did you manage to organise two Summer Universities? Organising two SUs was much easier than it sounded! 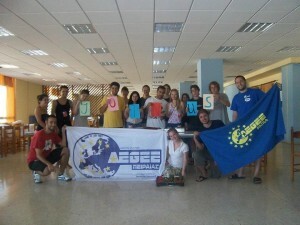 AEGEE-Patra & AEGEE-Peiraias helped a lot the IT SU with fundraising. When it comes to actual organising, there were different people working on each SU! About the IT SU, one of our members, Manos Valasis, has recently become the Development Manager of the new Online Membership System of AEGEE. While trying to enroll more people to get involved on all levels (programming, design, testing, etc), he came up with the idea of organising an event in which participants would increase their knowledge, get practice by working on the real systems of AEGEE, and also get involved in the IT life of AEGEE. And all that in the context of a Summer University! George Dimitrakopoulos (AEGEE-Patra, Information Technology Committee Speaker) and Costas Deltouzos (AEGEE-Patra, SUCT IT) were eagerly enrolled and that is how the journey started. Later on, we decided to hold in parallel another training that would introduce AEGEE to participants, and that is the moment where Hara Kogkou (AEGEE-Peiraias, SUCT Manager) and Alma Mozgovaja (AEGEE-Riga, Comité Directeur) joined the team! In the end, the participants enjoyed the relaxed learning by creating a great atmosphere and were even able to complete several tasks during the Summer University. Now, they are a small nice company of friends developing the Online Membership System. So, all-in-all, it went excellent, we would say! 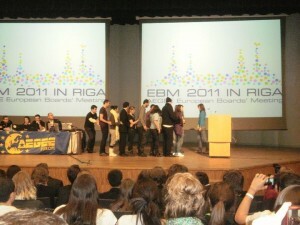 Certainly, the event was of great added value for AEGEE and for the participants themselves. In fact, we encourage all other locals to take up such an attempt and organise an event with real content themselves! It should definitely be repeated, but this is up to the Information Technology Committee to decide – if there is any local interested in organising it next year, please approach George at itc@aegee.org. Your mascot was stolen during this SU, proving that you are not the only ones who are good at this popular AEGEE game. What did you have to do to get it back? First of all, the story about our mascot is really special. It was a gift from a member of AEGEE-Peiraias, who before the EBM in Riga entered a gift shop in Zürich and considered that a dolphin would be a really special gift for our antenna! The name of our mascot is Delfinopoulos, and it consists of two derivatives: Dolphin (Δελφίνι in greek) and -όπουλος (the most common suffix for surnames in Greece), so Δελφινόπουλος (or Delfinopoulos) was ‘born’ the first day of EBM Riga, February 23rd 2011, making his zodiac sign Pisces. The reason we considered having a dolphin as a mascot was that Peiraias is the biggest port in Greece and the dark blue color which is in the antenna’s logo also, is a symbol of the Greek sea. We had our mascot stolen many times. The first time was right after its birthday in EBM Riga, where Juan Sordo Barreiro (AEGEE-Oviedo) stole it and we only got it back after we danced the infamous ‘Melon-Sandia’. It was also stolen from our headquarters in Peiraias, by a member of AEGEE-Tallinn. That time, our task was to act like dolphins at AGORA-Alicante in front of everyone! Another time was in Crete, during our previous Summer University, but as you may know, we had to wait months before our beloved mascot was returned to the local organisers. The last time we lost it was during our Summer University in Kefalonia this summer! Our task was to clean every toilet/shower in the dormitories, even though we believed the mascot was stolen in an unfair manner. 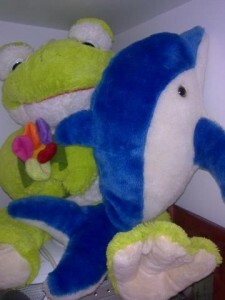 Finally, we took Delfinopoulos back, but we are sure that it is going to be stolen again. Getting back to more serious stuff, what are the future plans of AEGEE-Peiraias? We are currently applying for a Youth in Action grant for an exchange with AEGEE-Las Palmas, AEGEE-Riga and AEGEE-Yerevan of which we are waiting to see if we will finally organise our event. We also want to organise a Local Training Course and after the summer we will discuss organising more events! The AEGEEan is looking forward to hearing about more initiatives of AEGEE-Peiraias and hopes that other antennae will follow their example. Once again, congratulations for being the local of the month!